The Origial Dish Drying Mat : Who is Schroeder and Tremayne, Inc.? Since our inception in 1915, we have been designing, marketing and distributing innovative, "Why didn't I think of that" products that help solve life's little dilemmas. Fortunately for us, with age comes wisdom. We don't have to be the biggest to be the best. We aim for quality of products, not quantity of products. Our products are solution oriented items that have been put through the wringer. Lucky for you, if it makes it to the store shelf, it has passed our in-house test team and it's worth buying. We know, it sounds so cliche but it is true! Our creative driving force is fueled by raving customer feedback. We know you have a world of products to choose from and we want you to choose ours. Bad customer service is bad business, it's as simple as that! so no matter how you have your kitchen decorated you are sure to find a color that compliments you're kitchen, and make it brilliant. 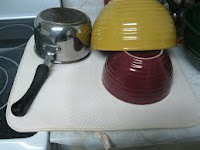 I was so pleased with my Original Dish Drying Mat, I got so sick of always having to wash and dry dish towels after drying my pots, pans and misc. drink and eat wear, that I begin a hunt for a good drying mat for my dishes, everyone of them that I bought was a big disapointment, waste of time, and a waste of money. They were too thin, too thick, would fall apart because they were too cheap made, way to expensive, or the fabric would be made weird and make the glasses that I sat on it fall over. Ugh! so far I have no complaints about the Original dish drying mat. I love the thick foam its made with, it absorbs all the water I sit down on it, no matter if it's from little things like drinking glasses, to bowls and plates, to heavy pots and pans. The mat holds up to 4 times its weight in water! The mat absorbs it and keeps the water absorbed until I'm ready to let it dry. The mat drys pretty fast alone, but I have found sitting it outside on a flat surfice helps it dry faster. I love that the mat has a hoop built into it so when I'm not using it I can hang it out of site, and out of mind. Unlike all the others I have bought. My Drying mat has other amazing uses besides a drying mat. I have found that it works wonders under my appliances! under my blender to keep from it scratching and scuffing up my counter top. 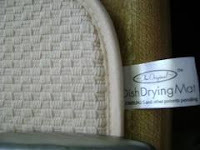 The Original Dish Drying Mat has other products I would love to get my hands on, such as the - Dish Drying Mat XL , Flip-It clean mitt , and the Wrinkle Release Towel . ♥ You can find the Original Dish Drying Mat on Facebook. ♥ I receive no monetary compensation for this review. 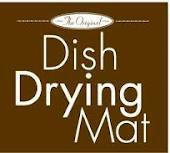 I was provided a Original Dish Drying Mat from Influenster to try and give my honest opinion.